Includes a contribution from Dr. Seuss. Includes coverage of Indians of the Totem Poles and a Tim Trudy paper doll. 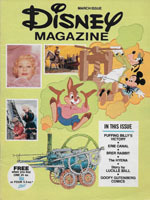 Includes coverage of the Grand Canyon and "Come to the Fair!" cut-outs. Includes coverage of the Texas Rangers and "Here Comes the Navy!" cut-outs. Includes coverage of dinosaurs and Chinese holiday cut-outs. Includes coverage of ice skating and "The Lonely Ghost." Cover art by Dan Lawler. Includes contributions from Martin Gardner, Margaret Hillert and Barbara Walker. Includes coverage of Matt Dillon. Includes coverage of Chris Atkins and MASH. Includes coverage of Scott Baio and Peter Barton. Includes various Halloween/monster-related features and puzzles. Includes coverage of E.T. and The Outsiders.